In England, traditional brides opt for a sweet confection on their wedding day - fruitcake! So I thought it would be fun to share a 'royal' recipe that you can try at home courtesy of Disney Family. Preheat oven to 325 degrees, and prepare a cupcake pan with paper liners. Combine dried cherries, warm water, and almond extract in a glass liquid measuring cup. Let the cherries soak in the warm water and almond extract for 30 minutes. Place yellow cake mix, eggs, and plain yogurt in the bowl of an electric mixture. Note: The yogurt substitutes for the oil in the boxed mix recipe. This is a low-fat substitution. When finished soaking, remove the cherries from the water and set aside. Pour the almond-infused water into the mixer with the cake mix, eggs, and yogurt. Place the cherries in the bowl of the food processor and chop for 10 - 15 seconds. Add chopped cherries to the bowl of the electric mixer. Blend all ingredients on low for 30 seconds, or until moistened. Beat at medium speed for 2 minutes. Pour batter into lined cupcake tins and bake for 23 - 25 minutes, or until a toothpick inserted in the center comes out clean. Divide marzipan into 3 pieces. Put each piece of marzipan into a separate bowl and add a few drops of food coloring to each. Knead the food coloring into the marzipan to disperse the color evenly. Place colored marzipan and white fondant on waxed paper and roll into 1/8" thick rounds. Use the round cookie cutter to cut circles from white fondant and colored marzipan. You will need one circle for each cupcake. 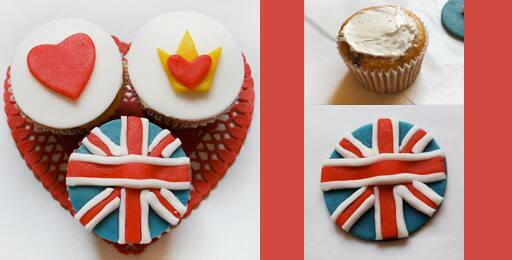 Cut British-inspired designs from the remaining marzipan and fondant using small cookie cutters, and a knife. Hearts, small crowns and Union Jacks make a festive display. Use a dollop of whipped frosting to "glue" the decorations onto the fondant and marzipan circles. When cupcakes have cooled, frost tops with a bit of the whipped frosting and then press on the fondant circles.